It's official, winter will continue for another six weeks. That's the verdict from the world's most famous groundhog, Punxsutawney Phil, who today broke the news to the thousands gathered at Gobbler's Knob in Pennsylvania. 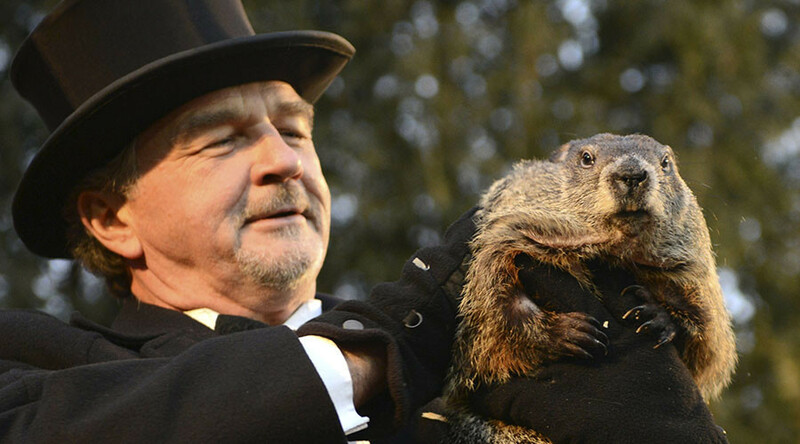 The show began from 6am Eastern (11:00 GMT) with Punxsutawney Phil soon emerging from his tree trunk home to forecast the late arrival of spring. According to tradition, if Phil sees his shadow, we get another six weeks of winter, but if no shadow is cast, we are rewarded with an early spring. The groundhog then whispers his prediction to the Groundhog Club president, who can translate it for him. This year, Phil suggested we should stay wrapped up warm for a little while longer. Unfortunately, Phil doesn’t always get it right, with a 46 percent accuracy record, although the members of the Punxsutawney Groundhog Club swear he’s right all of the time. Staten Island’s Chuck, another famous predictive critter, is far more reliable, with 80 percent accuracy. Although Groundhogs usually live for up to eight years, Phil drinks a magical punch at the Annual Groundhog Picnic in the summer, which adds an additional seven years to his life. The tradition of February 2 as Groundhog Day dates back to 1887. Local folklore says that a groundhog – a type of marmot, also known as woodchuck or whistlepig – can predict the weather for the next month and a half. It stems from a Christian holiday, Candlemas Day. Taking place halfway between the winter solstice and spring equinox, priests would bless candles and, if it was a sunny day, it meant there would be a longer winter. If it was cloudy, warm weather was expected. A hedgehog was later brought into the mix. When early German settlers in the US carried on the European tradition, they started to use groundhogs instead. Back in the 1880s, the Punxsutawney Groundhog Club would also hold a groundhog hunt in the summer, but stopped as Phil’s popularity grew. As many as 30,000 people gather to witness Phil’s prediction and the festivities bring $1 million to the local economy each year. The reason the groundhogs stick their heads out of the ground isn’t just to help us predict the weather. Male groundhogs are on the hunt for mates at this time.